It’s been a bad week for comedians and free speech. Yesterday, the news came out that the FCC would investigate Stephen Colbert‘s quasi-homophobic comments about Trump. 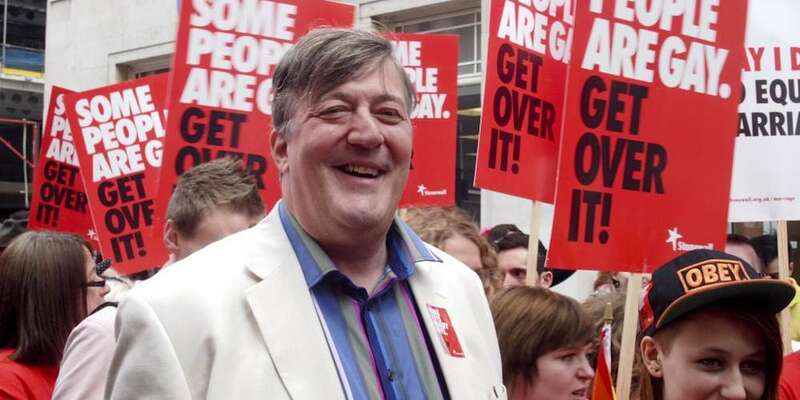 Today, the Republic of Ireland launched an investigation against Stephen Fry for blasphemy. The complaint stems from a February 2015 TV appearance. When Fry appeared on The Meaning of Life, hosted by beloved Irish broadcasting legend Gay Byrne. The show, running since 2009, features Byrne asking celebrities questions about their faith, philosophies and other heavy issues. 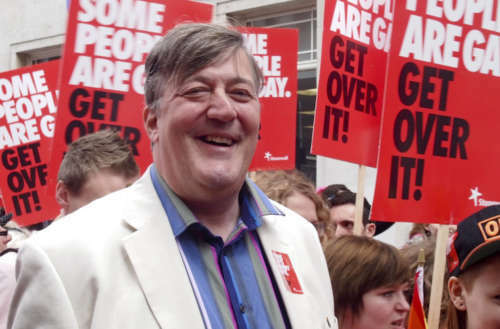 In Stephen Fry’s episode, Byrne asked him about what Fry would say to God at the Pearly Gates. I’d say, ‘Bone cancer in children? What’s that about? How dare you? How dare you create a world in which there is such misery that is not our fault?’ It’s not right. It’s utterly, utterly evil. Why should I respect a capricious, mean-minded, stupid god who creates a world which is so full of injustice and pain? That’s what I’d say. The god who created this universe, if it was created by god, is quite clearly a maniac, an utter maniac, totally selfish. We have to spend our life on our knees thanking him?! What kind of god would do that? Yes, the world is very splendid, but it also has in it insects whose whole life cycle is to burrow into the eyes of children and make them blind. … Why did you do that to us? You could easily have made a creation where that did not exist. It is simply not acceptable. Atheism isn’t just about not believing there’s a god, but on the assumption there is one, what kind of god is he? It’s perfectly apparent: he’s monstrous, utterly monstrous and deserves no respect whatsoever. Ireland’s blasphemy law prohibits “matter that is grossly abusive or insulting in relation to matters held sacred by any religion, thereby causing outrage among a substantial number of the adherents of that religion”. However, there have been no blasphemy cases brought before the court. Should Fry be convicted, the maximum penalty is a 25,000 Euro fine, or a little over $27,000. The law was passed in 2009, making Ireland the only country in the developed world to introduce a blasphemy law in the 21st century. The law was introduced because Ireland’s constitution, written in 1937 only granted Christians protection of their beliefs. The new law applies to all religions. The BBC reports that, according to a source, it was “highly unlikely” Fry would be prosecuted.